Last year, we started to let Angel learn to cycle on a two-wheel bicycle. I don't think there is a 'right' age to learn cycling but I just thought she was ready to move on. Some people have told me that all it took was one session for their kid to master how to cycle, and all they had to do was to hold the bike, run along with the kid for a while, let go and the kid will learn to pedal on his own. In fact, one of them told me that half an hour was all I needed. It sounded too good to be true and indeed, it didn't work out as such in our case. At the end of each of the first two 1-hour sessions, I was exhausted, my back was aching, my leg were tired, and my girl still had not learnt how to pedal and balance on her own. I didn't want to give up but I didn't want to force her into doing it it, so we decided to take things slower and we went back home to let her practise more on her balance bike for the next couple of months. Although she could already ride her balance bike, I asked her to accelerate a bit more, let her conquer steeper slopes and made sure she was able to control the bike and not let it control her when winding round turns. When she seemed to be more confident, we went to the park again to rent a two-wheel bicycle to try. By this time, I was already heavily pregnant and despite the hubby's advice, I went on to follow my big girl, helped her to start off, steadied her when she started pedaling and lo and behold - after a few tries, she took off and did it on her own! It was amazing to see her do it and I had this immense sense of satisfaction in me when she rode past the daddy and the little sister who were building sandcastles by the beach. "That's my girl! She can now cycle! Woohoo! ", I said to myself as I jumped for joy. It was yet another precious milestone which I will remember for a long time. So, the next step was for us to own a two-wheel bike so she could continue to practise! Considering that my girl was still not very skillful in turning and that she is not tall for her age, I thought that her first real bicycle had to be two-wheeled yet not too bulky, tall or hard to maneuver. So when tikes N bikes sent us the new KinderBike Morph, one look told me that the size was just right. The KinderBike Morph is a hybrid bike - first of its kind - that combines two in one and can be easily converted from a balance bike to a pedal bike. Sounds pretty cool, right? I totally believe in using a balance bike to teach kids how to coordinate, balance and ride. In my view, you should first learn to balance before you pedal and not the other way round. In fact, we already own a Cruzee at home and that is how Angel has been practising her balance skills (you can read our review here). To have a hybrid bike that converts easily and quickly from a balance bike to a pedal bike, you are getting the best of both worlds. So, we tried the KinderBike Morph and here is our take on it. 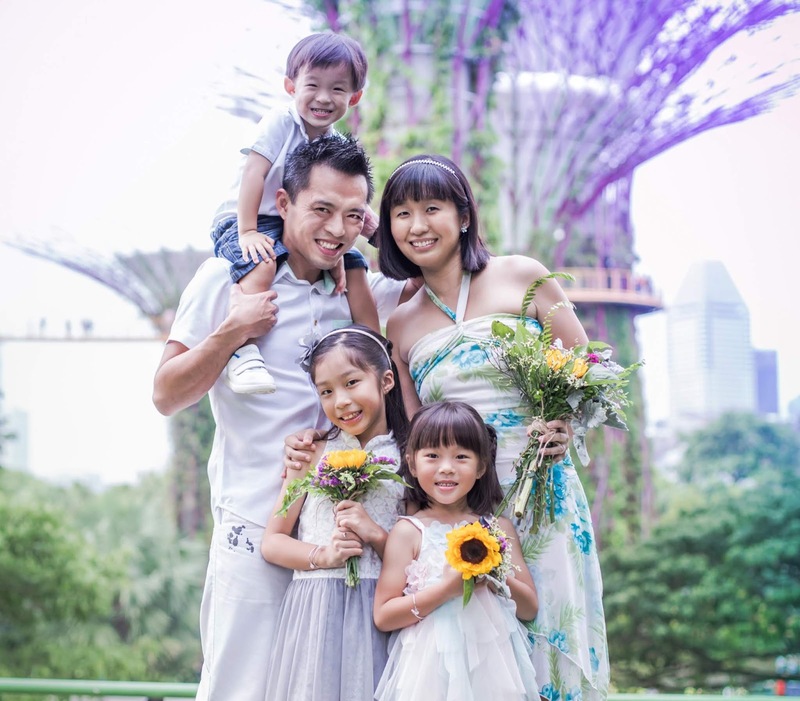 1) It grows with your child from 3 to 6+ years old and fits heights between 90cm and 120cm. That also means that if you have more than one kid, they can share the bike or the elder one can pass on to the younger one when he/she progresses to a bigger bike. 2) Unlike EVA foam wheels, it features pneumatic air tyres which mimics a real bike in terms of a cushioned ride. This means there is more traction and suspension. I actually like my girl to use a bike that feels like the real thing but the downside about this is that the bike will be heavier and harder to carry. 3) Converts easily using an innovative technology called v channel lock system with minimal assembly. All you need to do is to loosen two screws with the provided allen key, slide out the back wheel portion, slide in the other wheel (one has pedals attached and the other doesn't), screw back tightly and you are done! If I can do it, anyone can do it too! At 110cm tall, Angel found it hard to pedal initially as her knees kept hitting the handlebar when she cycled. Then we discovered that the handlebar height was adjustable and when we put it to the highest, it worked perfectly for her. The padded seat feels comfortable and more importantly, it can be raised or lowered (12.4" to 21.5" tall) quickly using a snap release. You can also unscrew to loosen and tilt the seat based on your child's preference. While we do go cycling at night, we seldom do it on the road. Nonetheless, we still attach front lights to the kids' bikes and it helps that the Morph comes with a front reflector too. Having long and short seat posts means you can easily adjust the height of the seat to suit your child's needs. At first, we were puzzled by the pedals which could not go backwards like normal bikes. This made it hard for Angel to learn to start off since she had some difficulty moving the pedal to the top position. However, then we realised it was because once you pedal backwards, you brake - which actually makes it easier for the kid to learn to brake and helps to prevent accidents. Besides the warranty, another good news is that the parts of the bike can be obtained from a normal bike shop and you do not have to go back to the supplier. Putting the bike together is quite straightforward and if yours is pre-assembled, our advice is to make sure that all the screws are tight and everything is intact. This was because the handlebar and pedals on ours were loose and came off after a while, however, once we tightened them, everything worked well. At 8.5 pounds, or nearly 3.9kg, it is not as light as our previous balance bike and thus the kids are unable to carry it on their own. However, this is mainly because of the aluminium body and the fact that it uses air, not foam, tires. After a couple of tries, Angel mentioned that her hands felt a little painful and we realised that the handlebar grips were almost too short for the width of the palms. To solve this problem, she had to wear a pair of gloves which was something that delighted her. You can also try getting new grips from a bike store. We've brought this point up to the supplier, who did a check and mentioned that KinderBike HQ will be able to supply bigger hand grips too. For a pedal bike, this one is petite and while it fits young children who are not too tall or confident to cycle, it also means that they won't be able to go too fast on these 12" wheels. It can be a good or bad thing and the way I see it, Angel is going to progress to a 16" wheels pretty soon and this bike will be passed on to Ariel. Overall, we are pretty pleased with the KinderBike Morph and the kids have been wanting to go out often to cycle and ride ever since we received it. You can see them in action here! Here's Ariel trying out the balance bike. Here's Angel enjoying herself on the pedal bike. 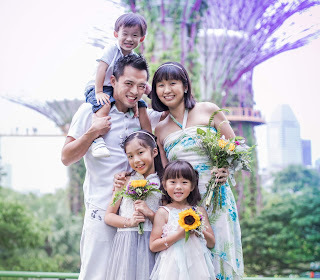 For now, I'm definitely looking forward to the day when we can go cycling together as a family! 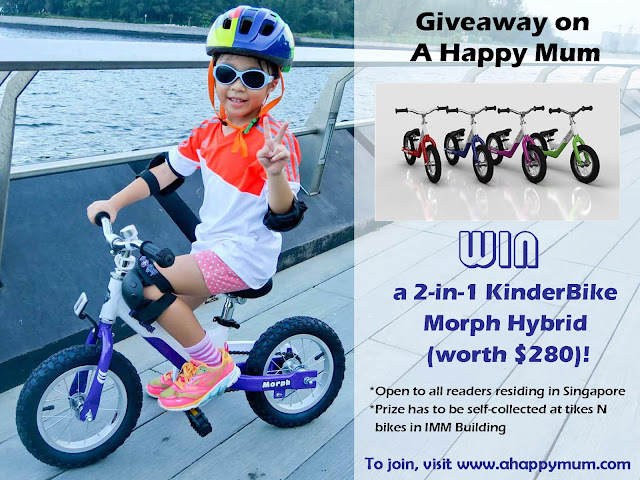 For those who are keen to win a KinderBike Morph for your kid, good news! - This giveaway ends on 9 Mar 2359hrs. Results will be announced here and on Facebook the next day. Winner will be contacted via email and will have 72 hours to reply, or a new winner will be picked. To participate, leave a comment in this blog post with your name, email address and choice of bike colour. Indicate in the Rafflecopter widget that you have commented and to increase your chances of winning, you can choose to carry out the rest of the options. Best of luck! a Rafflecopter giveaway Disclosure: We received a Kinderbike Morph from tikes N Bikes in doing this review. All opinions are our own. Fierce RED for my 5YO! Hi! This bike would be a great birthday present for my boy who is turning 5 in March! After he outgrows it, my girl who will be turning 3 next year can share the bike too! Thanks for giveaway! Would like to get blue for my boy. Purple is great for my 3 year old daughter. I would love to win this lovely kinder bike �� for my 3 years old son as he always wanted a bicycle for his own. And he prefer red colour. Hope to be one of the lucky ones. I would like to win a green bike for my almost 4yo boy. Red would be a unisex colour for my three kids. I would like to have one for my son who just turns 4 years old this month. Purple so that both kids (both and girl) can use it! Blue for little boy pls. My 4 years old will be thrill to receive this kinder bike for her 5th birthday this March! My 5 year old would love to receive this bike! She's been so jealous of her didi's tricycle I think a big kid bike will make her super happy (: thanks for the giveaway! My 2nd girl loves purple. It will be a great to win this for her. She can pass down to her younger sister too. Hi Summer, I would love to win this for my son who will turn 3 years old in Apr! He is adventurous and eager to learn. Color: Definitely Green as this is my boy's favourite color! Love this design. Hope to win a red set for my 3 years old gal. Active & eager to try new stuff! Colour : Blue for the boy. I hope to win this for my 4yrs old son as his first bicycle for his upcoming 4yrs old birthday gift. He had always been going cycling with his father riding him on the child seat and keep wanting a bike so hope to surprise him with this gift. I will love a Green bike for him as it is his favourite colour. Would love to win it for my boy who is turning 3 soon in apr. My girl is turning 4 this year and has been pestering us to get her a bike and she wants a girly bike... I hope she can win this bike before her birthday. I'll love to win a red or purple bike for my youngest girl aged 4.5 years old. She has told us recently she wants to learn how to cycle and I hope this bike can help her. She has a didi due this July so she can pass on the bike for him in future if she wins. Thanks! Hope to win one in purple for my 3kids. Thank you for this wonderful giveaway! Hope to win a red bike for my 3 years old active boy. I wanna win blue for my 3.5 year old boy. Hope to win a purple bike for my 4 & 5 years old children. I can imagine their happiness if I can win this for them. Thank you for the giveaway. My little 4 year old will be so pleased! I am hoping to win this for 2 boys (my nephew) who misses their mother and hopefully with this bike their mum can spent more time gg with them to the park! Thanks for the review and giveaway. Hope to win this for my girl and boy! thank you for providing the giveaway contest. My two big girls (aged 7 and 5 yrs old) love cycling and this bike will definitely help them to master cycling on two wheels. They can then join their daddy on his cycling sessions. I would like a red bike for the boys please! for my 5 year old son. who do not dare to cycle . I would like to get the red one for my 4 year old girl and 3 year old boy . choice of bike colour: BLUE for my 3yrs+ boy! Would love a red one for my 4 yr old if we win!!! Hope to win a green one for my 6 year old! Would love to win a blue bike for my 3 yrs old girl and 10mths old boy. Thank you very much!! Bike colour: His fav colour Red for my 5 yo. This is so cool!!!! Hope to win for my kids!! I would love to win this kinder bike for my 5 year old son. I would love to win this for my 5year old mid autistic girl. She is currently attending EIPIC school and they are trying to teach her to cycle. Hope to win one for her so i can teach her to pedal! Thank you for your detailed review and the giveaway! My 5 years old boy will love this bike. Both my kiddos love the purple bike! Great color for both genders. Purple colour for my daughter! I would like to choose green for my son of 96 cm! Hope happy mum can grant his wish then he will be able to cycle to school daily! I would choose the Red bike! All the colours look awesome! Green would be my choice if I have to decide on one. Purple for my 4 year old. Green bike for my 3yr old. Daddy say is time to get a bike for the kiddos. However, we do not know which model and functions best suit our needs. Chance upon you reviewing the balance bike and really loved to win this to teach them a new set of skills. Glad to see this! Awesome giveaways on their way. I like the purple one! Thanks for hosting. Hoping she can master it and we can ride together. My little loves PINK. But i think she can make do with red/purple. Will like to win this bike for her up coming 3 year old birthday. Currently she is using her brother pass down BLUE balance bike. My little prince loves the colour blue and I know he would be over the top to get his first bike in his favourite colour! Thank you so much for having this giveaway! Tks for giving us a opportunity to know that there are such a great bike, hopefully I m lucky enough to win this for my 5y2m gal ✌��️to learn cycling .. Preferred Colour: Red for my 5yrs old girl! Blue bike for my this yr 4 yr old boy. Hi! My 4 kids would love it! Though they have to take turns to play. ;) Perfect age, perfect bike. Green or red is my preferred choice of colour. Thank you! Definitely red for the girls! The red one for her as red is her favourite colour! She just loves cycling around in her tricycle and this bike would be a fun surprise for her!